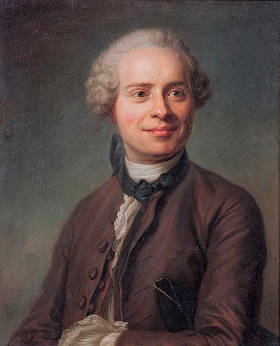 This system was created by Jean Le Rond d' Alembert, and is a little like the Martingale system in a way, but uses a different logic. In the d'Alembert system, you increase or decrease the size of your bets depending on whether or not you won the last round. If you won on the last spin, you reduce your bet, whereas if you lost on the last spin you increase your bet for the next one. Essentially, if you are winning you bet less, and if you are losing you bet more. The logic behind this method is that if you win one round, you are less likely to win on the next, therefore you should decrease your bets to avoid losing as much money. Conversely, if you lost on the previous round, you increase the bet because you are more likely to win on the next spin of the wheel. The d'Alembert system follows the idea that “nature seeks equilibrium”. I'm hoping that you can immediately see how this is a flawed logic, but I'm going to explain anyway. The d'Alembert system assumes that the outcome of one event is dependent on the outcome of past events. However, in roulette the outcome of any spin is completely independent of any results from the past. Just because you have hit the right colour for a few spins, it does not mean that the chances of you choosing the right colour or the next spin will increase or decrease, the odds at roulette are always the same. However, we can be sure that the roulette wheel isn't going to be thinking “I better mix it up a little”, and so the odds of the spin being red is equally as likely as it is to come up black. To the misguided player, this system may well make perfect sense. But the player that knows the fundamentals of probabilities and odds will realise that it is not a system that is ever going to make you any money. The only thing that changes in this system is the amount you are betting, and the house edge is always there regardless. The d'Alembert system is founded more upon superstition than anything, and neglects to include the principles of mathematical probability. So just as with any other system, don't rely on it to help you win more money over the long run.